The rustic appeal of this old chair makes a great garden feature. Paired with a pre-loved pot on the seat it is just waiting to be planted with colour. 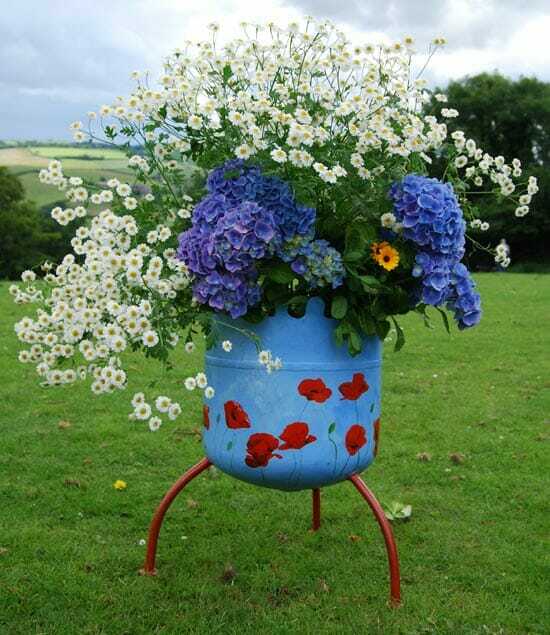 Your garden reflects you – what you like to grow – and repurposed planters can highlight your taste for the unusual, beautiful, antique, colourful or even quirky! OK, so unique and quirky may not be everyone’s taste but if you’re artistic and good with a paintbrush like this garden artist, then a Milk Bottle Wall Planter may be your style! 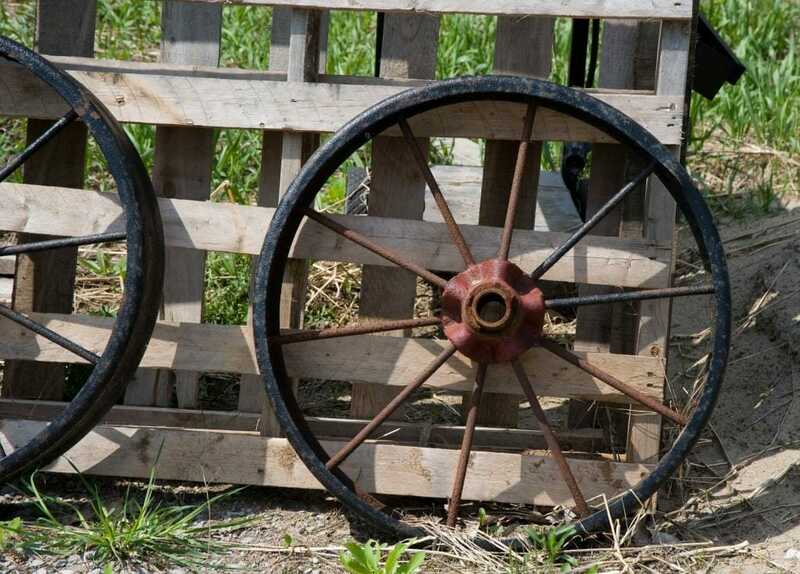 Wheel Planter – Laid flat on the soil, an old repurposed cartwheel would make a practical framework for a unique feature garden bed filled with herbs or flowers. The wheel spoke ‘wedges’ would form natural borders for the different plants. 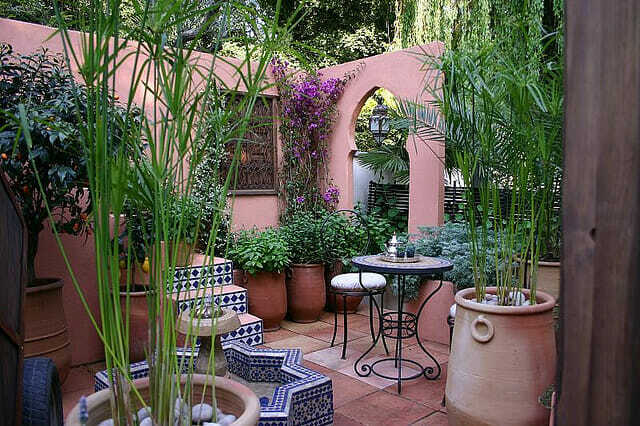 Painted, it could be colour coordinated to suit your garden tastes or theme. Refuse, Reduce and Container Reuse! 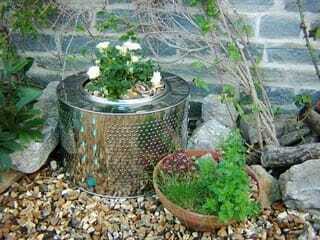 Rather than throwing broken white goods away, one creative gardener has reused the cylinder from a washing machine as an attractive metal cachepot with a smaller pot inside it. A very modern micro garden! Refuse: we decide not to consume something in the first place because we don’t really need it. (e.g. 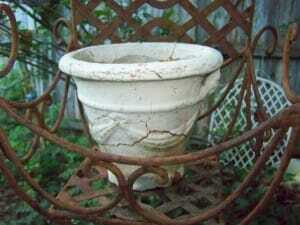 avoid buying a new pot – look for an alternative container that can be reused instead). Reduce: we cut down or minimise what we use (materials and energy) or how frequently we do so. (e.g. we may supplement the need to buy in mulch by growing some of our own needs in our garden). 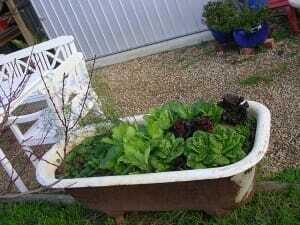 This bathtub has been repurposed as an attractive feature garden filled with delicious salad vegies. Repair: if possible, we use our skills or limited additional resources to restore functionality. (e.g. 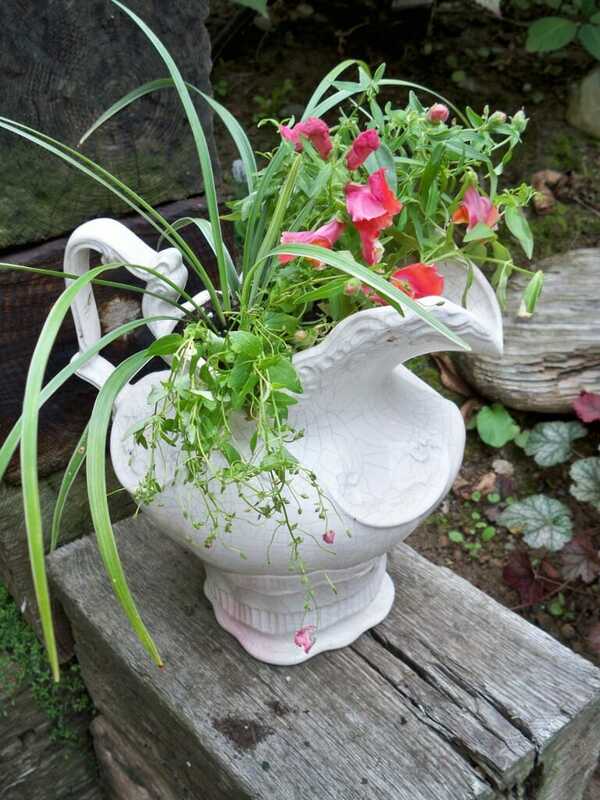 a cracked jug or urn may be repaired with glue and whilst you may not be able to use it on the kitchen table anymore, it might make a great cachepot planter in your garden). With a little imagination, kitchenware that may be damaged or cracked can be repaired or reused as attractive garden planters. Recycle: importantly, this is the last option after exhausting all the ones above – an item or material is broken down into more basic elements before being reprocessed for the same or alternate uses. (e.g. here’s where we use our council recycle bin). 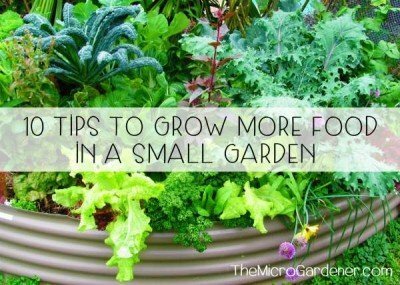 So being resourceful, responsible gardeners not only helps us go easy on the pocket but we are doing our bit for the environment – one decision at a time. 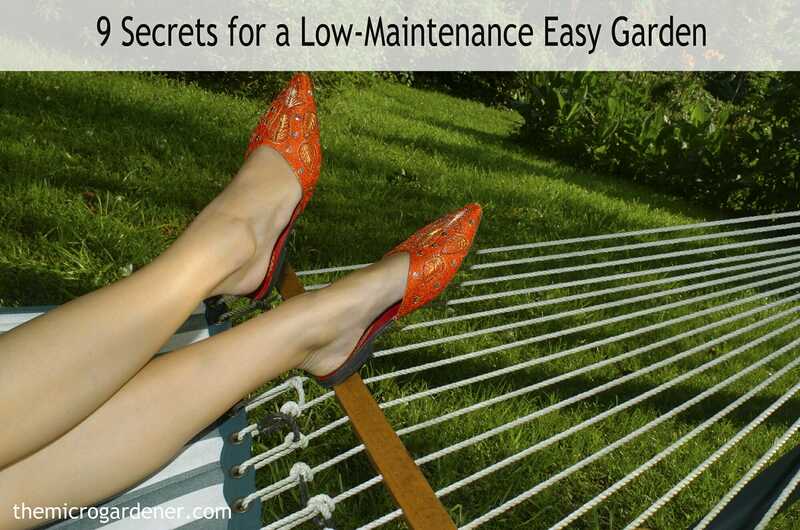 Some of my most treasured garden features are ones I spent very little on or gave a makeover to … and it’s incredibly satisfying! 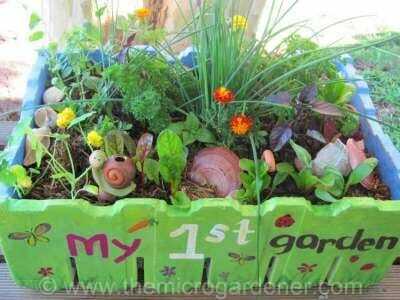 This polystyrene foam box from the green grocer was reused as a ‘one of a kind’ micro garden. Colourfully hand-painted by my daughter and filled with her favourite salad ingredients, miniature garden art and shell mulch it is still a favourite in our garden. reducing our personal environmental footprint on the planet. This hand painted steel planter was made from a collection of salvaged materials (drum and pipes) and repurposed into a useful garden. Planted with spectacular colour coordinated flowers, it’s an example of how anyone can create a unique planter with a little imagination. In nature, plants grow successfully without any help from humans! They don’t NEED expensive containers or fertilisers – the rain, sun and soil food web work perfectly well on their own. 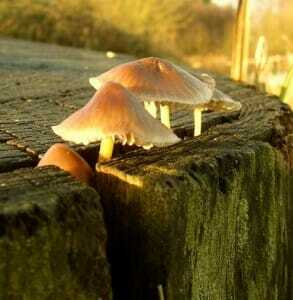 Some plants find their own ‘containers’ in rotten logs, tree branches and other natural spaces. 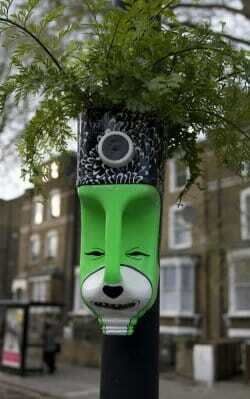 No space is wasted in nature! Here some plucky little fungi have found their own ‘garden’ to grow in: a crack in the top of a tree stump. 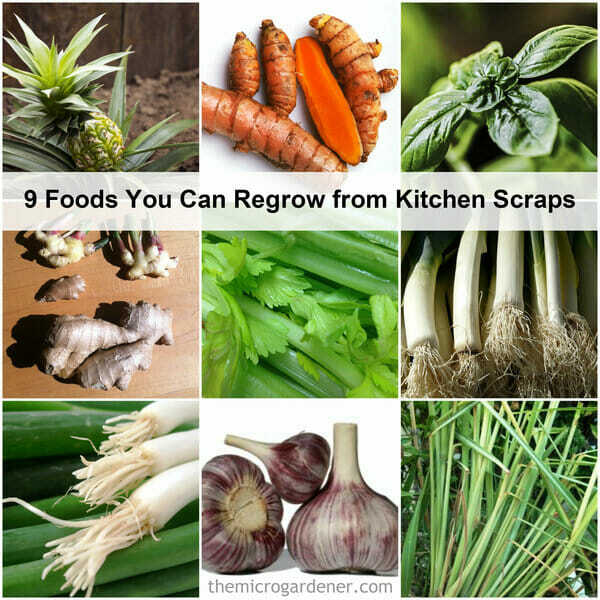 Plants recycle their own nutrients during their lifetime and there is no waste or garbage tip needed in nature. There’s always some creature ready to take what isn’t needed anymore and re-use it for food or shelter! Just this morning I watched a wasp carrying green leaves into the finger of an old glove to make a new nest for its family. The wasp had no reason to waste a perfectly good space when they could set up home in there! 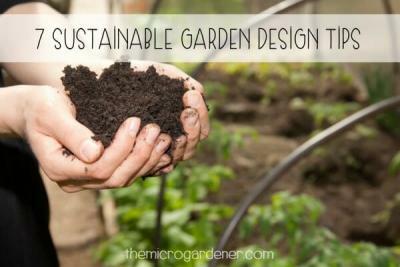 It reminded me we can all do with a fresh perspective on the usefulness of resources we are not taking advantage of or things that could be given new life and purpose in our garden. Copying nature’s fine example, a hollowed out rotten log is filled with rich potting mix to create a log planter. 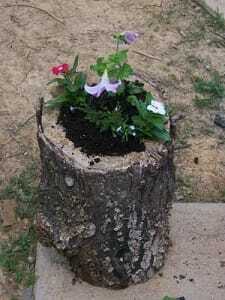 Next time you lop a tree in your garden or find an unused log, consider repurposing it into a micro garden. The process of saving, restoring, refurbishing, renovating, repairing, rebuilding, revamping, reconditioning, reinventing and re-using an item in another way is a positive, satisfying experience – and one that imitates the wisdom of nature. 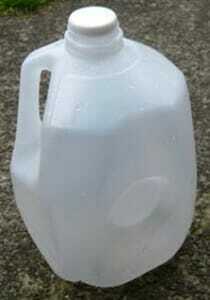 Plastic 2 litre milk jugs– these are used in lots of ways in the garden: fruit fly traps for the fruit trees and fruiting vegies; improvised watering cans; cut and used as scoops for fertilisers, potting mix and bird food; cut into plant markers/labels; funnels and seed raisers. Plastic containers like milk bottles can be recycled in your collection bin but even better – reused with a new purpose in your garden. With a handle and lid they make perfect watering cans and are easily converted to a fruit fly trap and hung from a tree. Tin cans – pencil caddy for the garden shed and to hold plant markers, plant ties and my ‘save for seed’ plant signs. Egg cartons – seed raisers. Icecream containers with lids – storage of all sorts of items like baling twine and string to tie up climbing vegies; crushed eggshell homemade fertiliser and food scraps for the worm farm. Toilet rolls – ‘pots’ for fussy seedlings that don’t like being transplanted. Polystyrene foam boxes– these are filled with homemade potting mix and grow incredible edibles as micro vegetable and herb gardens. Shallow foam polystyrene boxes have good drainage holes and can hold loads of leafy greens when repurposed as a micro garden. Glass jars and plastic containers with lids – these are perfect for carrying small quantities of organic pelletised and powdered fertilisers, rock minerals, soil conditioners, Epsom salts and worm castings in my flexible garden bucket. Plastic spray bottles – used spray bottles from eco-friendly household products are washed well and re-used in the garden (for homemade pest sprays; diluted seaweed foliar spray; and filled with water for misting seeds and delicate seedlings). 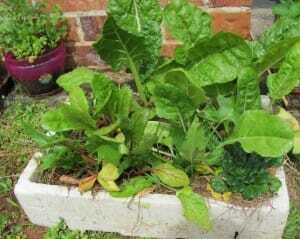 Glass juice bottles – to mix up liquid organic fertilisers like worm juice and compost tea. Want more photos and ideas? 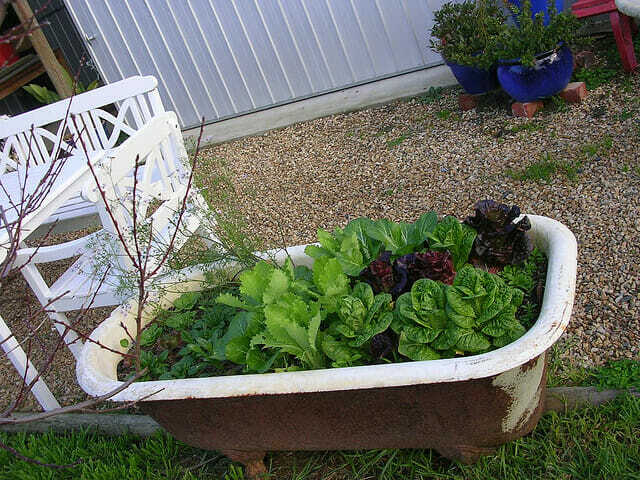 Check out these clever design ideas, tips on frugal gardening, thrifty recycling ideas for the garden and more on repurposed containers. Like to see some inspiring photos of how others are using clever repurposed planters in their gardens? I’ll be posting more soon, so if you don’t want to miss it, subscribe to my newsletter (and grab your free eBook) or click on the RSS feed below or to the right. I have been through a number of DIY sites and haven’t found one that mentions the concept of all items that can be repurposed. I am working out a plan to create a vertical planter out of Herbalife containers. The only repurposing I saw someone posted was using them as a decoration. I know not everyone orders them, but there has to be one creative person out there who is an Herbalife customer.